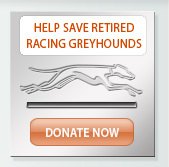 There was some discussion previously on a vet blog regarding a greyhound that was not eating. 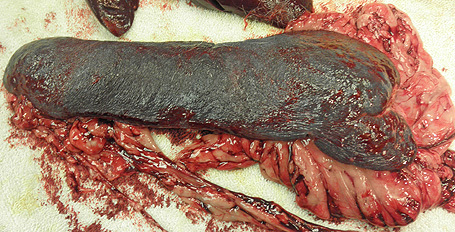 Our staff veterinarian responded that loss of appetite could possibly be due to an enlarged spleen. 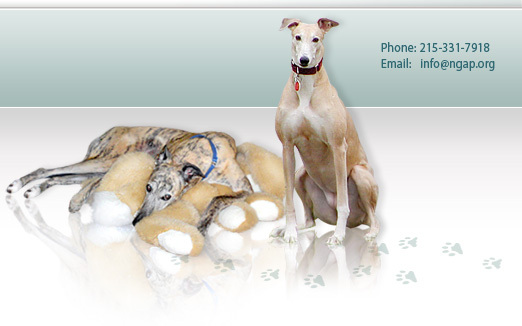 Another vet dismissed the possibility because it is not uncommon for greyhounds to have enlarged spleens. The size of a greyhound's spleen should be absolute, rather than relative. 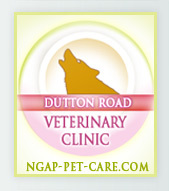 We have done many, many splenectomies at our facility, as well as necropsies, on greyhounds. The first organ that you find when opening up the body cavity is the spleen. There are times when it is so large, it gushes out as soon as the incision is made. Through our experience with spleens, our staff at National Greyhound Adoption Program feel that a greyhound spleen should be approximately 12 inches in length, 3 1/2 inches in width and a 1/2 to 3/4 inch in thickness, tapering from the middle. The color is a deep brownish-purple, with rounded edges and an even texture. That spleen would weigh about 1 1/2 lbs. to 1 3/4 lbs. A normal-sized spleen will not negatively affect a greyhound's normal bodily functions nor adversely affect other organs. An engorged or enlarged spleen may push, or put pressure on other organs in such a way as to restrict their proper function. Some of the spleens we have removed were hemorrhaging and if they had not been removed at that time, the dogs would have bled to death in short order. Most of the spleens we have encountered have been intact, and some included an attached growth. 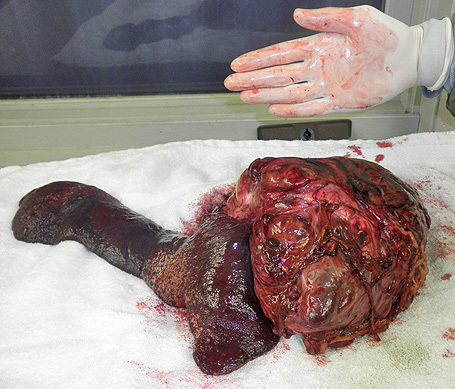 That growth alone could be several times the size of the spleen. I recall one post, a few years back, where a veterinarian determined that a particular dog had cancer of the spleen based on an ultrasound. Since no biopsy had been performed is would be very difficult to make that determination. The growth may or may not have been malignant. It's the flip of a coin. 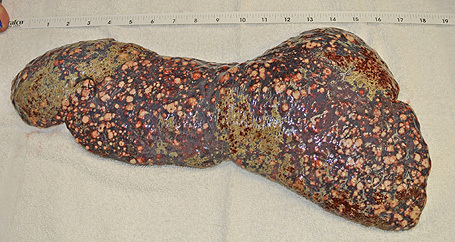 The largest spleen ever removed at NGAP almost completely covered the area of a Mayo tray. 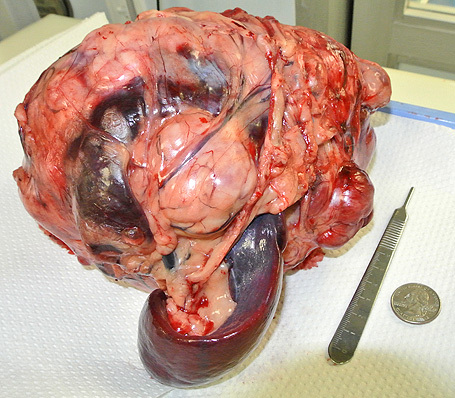 It weighed over 9lbs.We also removed a spleen that weighed over 8.6 lbs and was the size and shape of a human head. If you can visualize removing a 5-9lb object from a dog's body cavity, you may be able to understand how adversely this may affect proper body function. All of the greyhounds that had these very large spleens removed originally presented with poor-to-no appetite but began eating again almost immediately and recovered their weight loss. In some cases, the dogs went on to live for years and in other cases died within a few months due to malignancy. 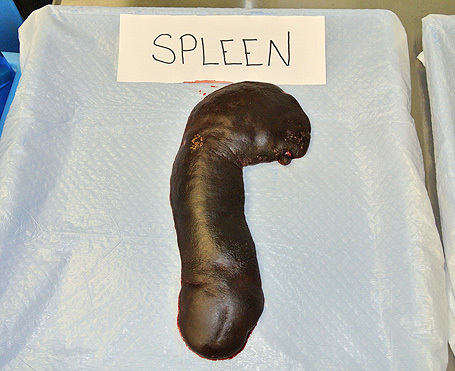 Ultrasounds, alone, are often not reliable in determining estimations of spleen size and often have no correct sense of just how large the spleen may actually be. In our opinion, if you have a greyhound that is not eating, has not responded to antibiotics, appetite stimulants, antacids, or diet change AND has an ultrasound indicating an enlarged spleen, an exploratory surgery would be appropriate. 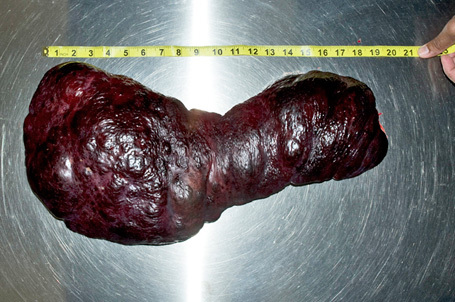 An enlarged spleen with a growth is not necessarily a death sentence. We have seen spleens with the ugliest growths come back benign. That determination cannot be 100% conclusive unless a biopsy is done. An exploratory can also be helpful in finding abnormalities associated with other organs, since the doctor has the ability to see those organs first-hand. 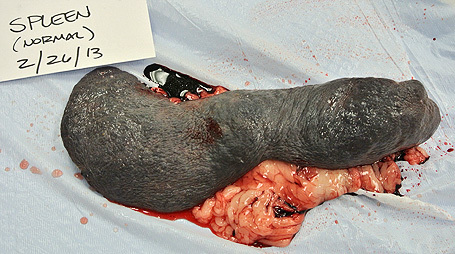 In some extreme cases, we found it appropriate to euthanize the dog on the table and not perform a splenectomy at all. We hope this information helps to clarify the difference between relative size and absolute size of a greyhound's spleen. The photos below show spleens of various sizes. Some of them were malignant and some non-malignant. Above: Irregular contour. Possible omentum. 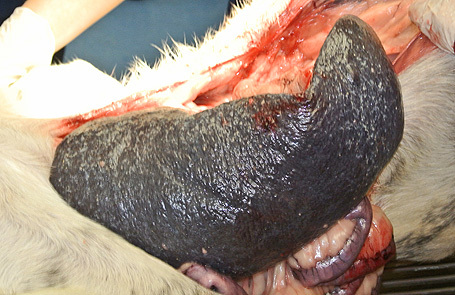 Above: Grey film over spleen with possible nodule on tail. 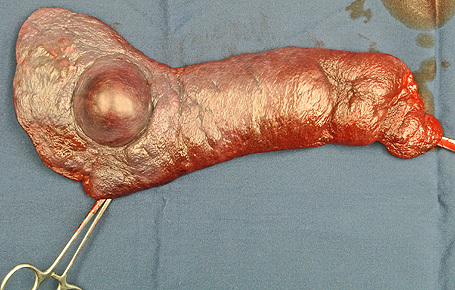 Above: Normal spleen with old injury.